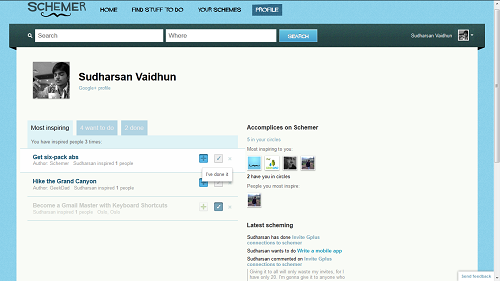 Google released Schemer, an activities recommendation engine with Google+ integration, in invite-only beta engine. Lucky me, I got an invite from Indhuja Pillai, a Tech enthusiast. All day being tired of just reading about it and my hands-on was so exciting. Here you go, hands-on from me. Schemer, revolves around 'I want to do it' and 'Done it already'. The Header bar, holding the name 'Schemer' has a cute little animated Moustache. Try hovering your mouse over it, soon as you get it. Tab 'Home' has a neat and clean 'Search Bar' and your profile controls, similar to the one in the Google Plus. Rooting my android is my first want to do. You can search for a Particular 'activity a.k.a Scheme' with a particular location information or Write your own Scheme and add information to it. You have a white and fresh Notification stream on your right. Scheme's of your friends in your circles stream in there. The Homepage include a stream where all the scheme from your circles stream and the default Suggestion bar is also found. Tab 'Find Stuff to do' - A sepearate tab dedicated to Search. A detailed search where you have a list of 'Recommended Schemes' and you can filter them using 'tags' & 'location'. Just by clicking on the '+' icon next to each scheme, the scheme marks it 'I want to do it' and clicking on 'tick' symbol marks it 'Already done it'. 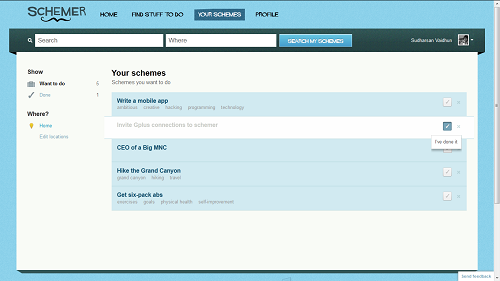 Tab 'Your Schemes' - All my schemes are enlisted - both 'want to do' and 'done'. Once a scheme is marked 'To be done', it stays on the list and remains there unless and until you have 'done' it. Actually till you click 'done it'. You can always fake things, when you are online! Tab 'Profile' - All your achievements, accomplices and your latest scheming are held. There is something called 'inspiring'. When someone wants to do what you have did, then its a inspiration, right? That is what inspiring in Schemer means. The Settings, is very much straight forward. It is simple (not much complex like Facebook) like twitter and you can add your other addresses, email, notifications and all that general stuff. Google+ account is very much integrated into Schemer that circles and Google plus profile is linked at very many places all over the engine. Schemer is very much a entertainer. As earlier said, Facebook events and Schemer! I don't find anything that much similar running between them. Just that they both talk about 'events in our life' and Schemer pulls our imagination and Facebook just stays only a little imaginative like the 'I'll watch TV and hear songs on 20/12/2012 event on Facebook'. A Pack of close friends and a good number can make it a lot interesting! 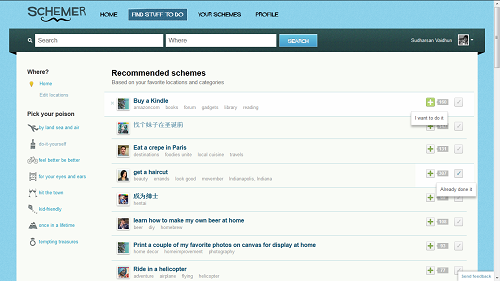 Get your Schemer engine as soon as possible and share your reviews under the comments. Request invites before time runs out - everyone has only 20 invites and I'm half done!